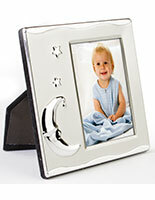 Why use these affordable sentiment frames instead of standard photograph displays to showcase precious memories? Photo albums from this collection include specific messages and designs to commemorate the amazing life experiences caught on camera. The graduation gifts and wedding favors highlight special moments taken with small photographs. Remember all of the special occurrences by utilizing the attractive displays of congratulations. These wholesale sentiment frames, commonly referred to as nostalgia photo holders, are available in both metal and plastic to complement the pre-existing décor. Place card displays may be adorned to the walls or setup on the countertop depending upon the model purchased. Create an eye catching presentation of graduation, baby shower or simple day at the beach photography. Sentiment frames for pets and other loved ones are used as decorative place card stands at banquet dinners with assigned seating. The highly attractive wedding favors support photography of different dimensions as well as other accessories from the important event. Nostalgia photo holders are able to present landscape or portrait format photographs to show-off precious memories and achievements to visitors. These frames feature the traditional black and silver finishes for matching the surroundings or contents. These discount frames only take a few moments to setup, but provide enjoyment for a long time. What types of occasions warrant the use of nostalgic photo holders? These sentiment frames celebrate may be used to celebrate all sorts of life happenings. People often use the photo albums as congratulations for graduations. The graduation framing provides spaces for inserting photos and keepsakes from the ceremony. Adorn the interior of the holders with tassels, pins and other important memorabilia. Graduates, parents and other relatives thoroughly enjoy the graduation gifts. The displays are popular presents at baby showers because many of the units feature designs associated with childhood. Borders may include moons, stars, balloons, teddy bears and other whimsical engravings. Parents insert images of the baby coming home from the hospital, celebrating a first birthday, taking steps or enjoying other precious moments. 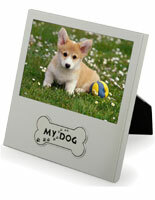 Pets can be remembered with the keepsake holders. Certain designs include an engraving that simply states, "My Pet" in attractive script with tiny paw print underneath the message. The gifts serve as wonderful gifts for anyone with a dog, cat, bird or other pets. The holders are amazing wedding favors to help guests remember the bride and groom on the special day. Portrait and landscape oriented displays feature a simple "Our Wedding" message beneath the opening for graphics. Many parties use the smaller borders as place card holders that invitees can bring home after the ceremony. These displays are perfect for use as wedding favors. 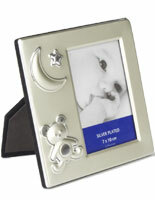 These themed picture borders make it extremely simple for users to put the images of a baby or pets into the fixtures. The displays open from the back for conveniently installing the graphics. Users undo the tabs on the backside and slide the new images. Owners of important pictures are invited to use the matte board, if provided with the model, to achieve an even more visually gratifying display. Each display includes a lens that will prevent the cherished photographs from being affected by dust or dirt. Once in the correct position, users can take the lightweight framing and position it in the home or office. Wall mounting borders only require a nail for installation. Countertop styles feature an easel backer to stabilize the images on the flat surface. Many of the graduation themed picture framing options have a shadowbox design for showcasing three dimensional objects along with the images. These wall mounting or countertop standing high school and college graduate gifts feature a white mat board that accepts tacks. Present fraternity pins, honors society pendants and tassels along with attractive image from the graduation. These picture frames will help create a gallery of memories for guests to enjoy.